Award-winning Nigerian-British writer Anietie Isong has published a new novel that explores Nigeria’s “brown envelope journalism’’ – the practice of accepting cash from news sources. The novel, Radio Sunrise is published in January 2017 by London-based independent press, Jacaranda Books. Anietie Isong has won several writing prizes including the Commonwealth Short Story Award, the inaugural Olaudah Equiano Prize for Fiction and the maiden Remember Oluwale Writing Prize. His short stories have been published in anthologies including, Roads Ahead, edited by award-winning British author Catherine O’Flynn. 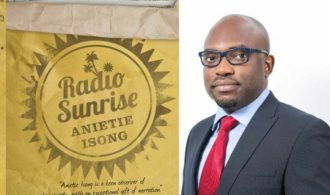 Anietie Isong was awarded the Authors’ Foundation grant by the Society of Authors in the UK, to enable him complete Radio Sunrise his debut novel. The prestigious grant is given to writers whose project is for a British publisher. Radio Sunrise is a hilarious yet sobering satirical portrait of Nigeria. The narrator Ifiok, is a young journalist working for the government radio station in Lagos. When he travels to his hometown to make a documentary about a band of ex-militants, he is forced to confront the ugly truth about the future of his beloved country and his existence within it.